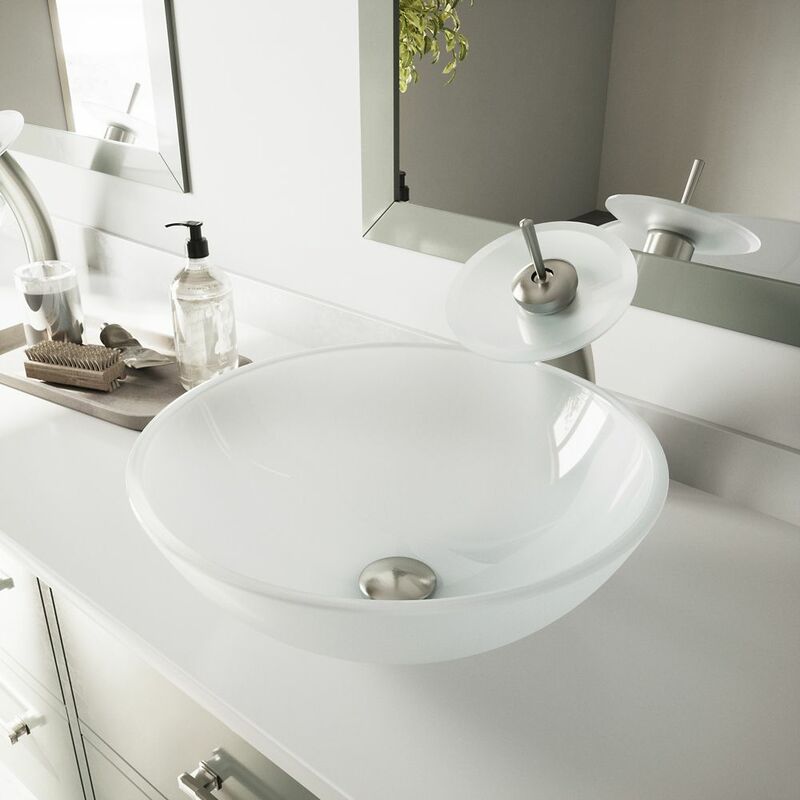 With a square design and unexpected matte texture, the VIGO Begonia Matte Stone Vessel Bathroom Sink will create a look that's edgy yet delicate in your bathroom remodel. Crafted from ultra-durable Matte Stone PMMA, this easy-to-clean sink is solid-core, meaning it won't crack, chip or scratch over time. This vessel bowl sink set also includes the angular VIGO Duris Vessel Bathroom Faucet in brushed nickel, along with a matching drain pop-up. This beautiful VIGO Camellia Matte Stone Bathroom Sink is constructed from VIGO's trademark Matte Stone PMMA, giving it a distinctively modern matte white finish and unmatched durability. The sink is solid-core and easy to clean, resisting cracks and chips over time. This bathroom sink set includes the unique cascading VIGO Niko Vessel Bathroom Faucet with a soothing waterfall-style spout. Also features chrome-finished pop-up drain and mounting ring. White Frost Glass Vessel Sink and Waterfall Faucet Set in Brushed Nickel is rated 4.8 out of 5 by 33. Rated 5 out of 5 by Tonga from Fabulous Product I have installed the Top mount Glass Sink and Waterfall Faucet and we are 100% happy with the functionality, looks and Quailty of the Vigo Product. I would highly recommend it !